This kit comes in a shrink-wrapped end opening type box. I am no fan of this type of box, because invariably the decal sheet or parts will find their way past one of the end flaps to become lost forever. Give me a tray and lid type box any day of the week. 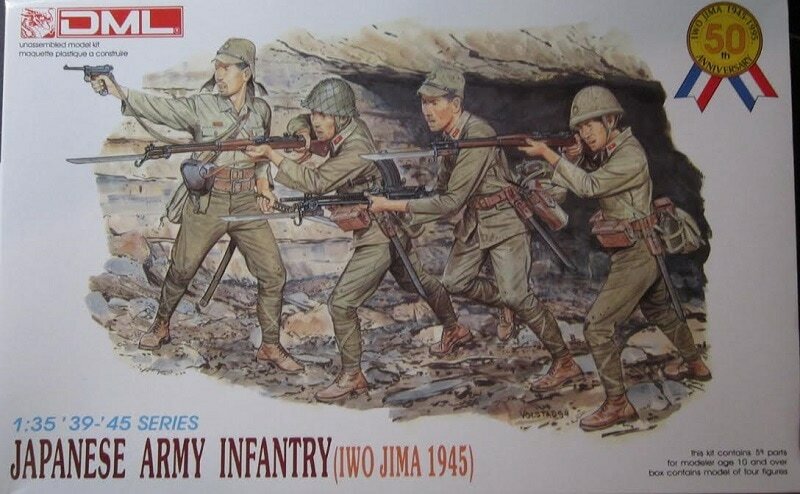 The box art shows 4 Japanese infantry men defending the mouth of a cave. They are all standing. They all wear light khaki uniforms. Their pants are bloused into gators that are wrapped in cross straps over low shoes. The man on the right wears a steel helmet with a cloth cover on it. He is armed with a Arisaka Model 99 rifle with a bayonet attached to it and is holding it up firing it. He has a water bottle, canvas sack, the bayonel scabbard and an ammo pouches on his belt. The next man wears a soft cloth billed field cap. He is armed with a light machine gun Model 99 and is aiming it. He has a canvas sack, a bayonet and ammo cases on his belt. The third man wears a steel helmet with a mesh cover on it. He is armed with a Arisaka Model 99 rifle with the bayonet attached and is aiming it. He carries the same load on his belt that the 1st man does. The fourth and final man appears to maybe be an officer, due to him having a samurai sword on his belt and a pistol holster. He has a canvas bag slung on his back. He is aiming a Nambu Taisho semi-automatic pistol with his right hand and holds the sword out of its scabbard in his left hand. He has a soft cloth billed cap with ear flaps on his head. One corner of the box art has a badge that commemorates the 50th anniversary of the battle of Iwo Jima 1945-1995. Another corner says that the kit is designed for modelers over the age of 10 and that it holds 59 parts. One side panel has 3 color box arts of other kits that DML manufactures: kit no. 6031, a U.S. Sherman Vc "Firefly", kit no. 6033, a German Stug. III ausf. F, Sd.Kfz. 142/1 and kit no. 6034, German Tank Hunters figures. 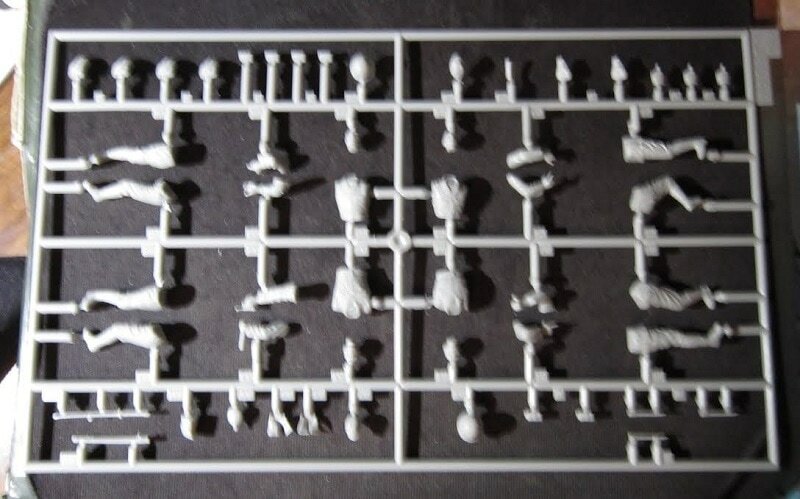 The other side panel says the kit contains parts for four figures and glue and paint are not included. This is followed by the copyright of the kit of 1995 and DML's street address in Hong Kong, China, their FAX number and MADE IN CHINA. The bottom of the box serves as both the assembly and painting instructions. drawings of a Nambu type 14 pistol holster, a haver sack and ammo pouches on a belt. All the illustrations are done by DML's resident artist Ronald Volstad. The box contains 2 light-grey trees of parts in 2 sealed cello bags. 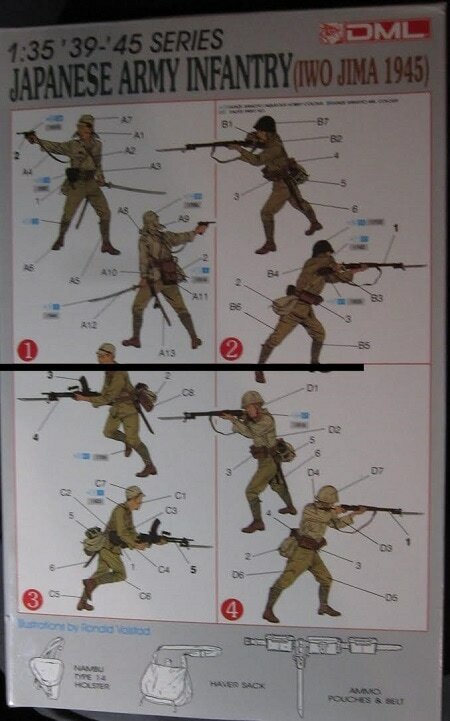 ​These figures are very well detailed and in poses that will make into a neat diorama. There are no decals in the kit.